An old photocopy with notes from last year. It has become the diagram for my next chapter. I like the way the very last part of the scan at the bottom, folded back from the photocopied page because it was not meant to be there, actually belongs very much to the whole project. I’m interested in the shift from real to fiction and back from fiction to real that occurs every time I am confronted with a memory and the impulse to document it. In such context I am not prompted to classify, but to interpolate: in its Latin origin the verb ‘to interpolate’ does not only mean to insert in a text something of a different nature, but also to refurbish it, at times even forge it. Our memories are refurbished and forged too, when we write them: they can never coincide with their event, and words will never be time-capsules-on-demand. A text is not an untouchable document calling for classifications: it elicits what is not there, what can be perceived across its borders. So I think of the borders of my experience, recorded and recalled. Where, and how do I articulate it, when I write? Rather than considering memory, I’d like to think of the history of a memory, as it moves from fixed document to yet another reinvention, slightly different every time I write, transformative and entangled. Language, when I write after my recollections, functions as a field of associations, a weaving of phrases echoing other phrases, so that I can begin to be infected with the sense of other meanings from the past, within those present. It is not about remembering an immutable past: it’s about the possibility of a present, which at times can also be a sonorous nothing, a stuttering reverb, a resonating chamber for thoughts and clusters of words that were not created anew but cast from words that were before, recalled from archival layers. In proximity rather than in understanding I am cut through by voices I don’t want to explain, but hand over to you before they expire. As I write I recall some verses from a favourite song by Arthur Russell called Home Away From Home, they seem to prompt me further: The birth of the moment is never ending / The rest is in the centre. I think of writing as the never-ending birth of a moment against the rest in the centre, its cry outstretched beyond its edge. Where is the edge of the tapestry of my I, woven in writing and unwoven in listening, reading and recalling? In the 1950 foreword to his ethnographical and autobiographical and truly visionary journey L’Afrique Fantome, Michel Leiris writes: ‘Truly a human measure, my horizon’. Sixteen years before, he’d closed the book saying: ‘There’s nothing left for me to do … but dream’. The time of each recorded memory is spanned by and spinned around the horizon of now and the edge of dream. In the thread of every memory I hear what wasn’t there and I make what is gone, actual. When I tried to make sense of – dare I say, theorise – the proceedings around this, I failed. It was always as if my attention dwelled in the peripheral – accidents of hearing, stories, personal trains of thoughts – rather than the assumed core, up until the time I realised the very core of my research and writing was in fact what was normally deemed peripheral. I have spent all these months working on my borders and on my silences. With time, writing has become more and more a way of reaching into what I cannot grasp or keep within the dimly lit borders of the self and of the memories that still prompt it: a way of adding on to experience, or to reshape it. As Lyn Hejinian stated in the title of her 1978 book, Writing is an Aid to Memory. Not the reverse. Never. 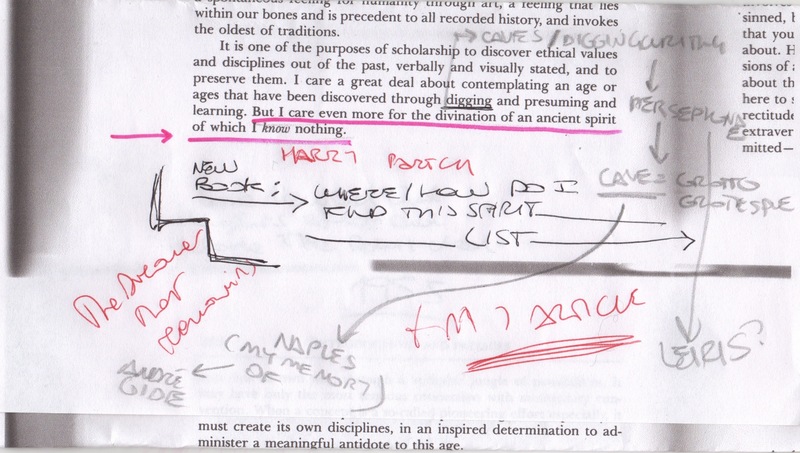 Writing does not derive from memory: it makes memory. It is an act of fabulation, rather than a transposition of a lost, detached, original truth: its engaged and mutable polyphony adds to an evolving process. Michel Leiris writes extensively in his autobiography Scratches/Rules of the Game, of the making of memory, of the reverse effect of a memory appearing solid, like a strange object reflecting ‘our real self’ on to us who seem lost and unreal and transient. His words outline a self-challenging ‘I’, body and mind, showing at once vulnerability, process and presence: they’re not concerned with making sense univocally, but with exploring possibilities for meaning. As a reader, which is so strictly connected with being a writer, I participate in an act of discovery made accessible to me through other writers. I apprehend texts, even if I’m not acquainted with what they write about. I see their form that states itself and speaks to itself and to me and once more, I see in each of them the individuality of an I opening up to many you’s. Writing appears in its singularity and in its histories of relations, it does not need explanations that cling to external references. It is an event, unique and historical that sets the conditions of its own functioning. Michel de Certeau showed in The Mystic Fable how the act of fabulation is triggered by the statement, ‘I will’. I read this enunciation, all steeped towards the I and containing nothing unless I resounds once more in the double u of will. This means that I in its ambiguity, can be a source of misunderstanding on one side, but on the other, it emanates the thrill of making something happen. The creative imperative is a pull toward the unspeakable so strong, that you want to make it present. Where am I, when I write? I ask this question because language is also the matter in which I take distance. As Robert Duncan wrote in The H.D. Book: ‘…in writing, deriving as I do, I burn the nets of my origins’. So in my book En abîme. Listening, Reading, Writing. An Archival Fiction I chose to make up and take distance from a number of scenarios. I did so to disrupt the mimetic function of the narrating I and any claims for an authentic origin, to play instead with layers of fabulation and focus on the actuality and impact of the text: I enacted my I, probing nudging teasing its doubles, turning into the double you’s of why where what whom. At some point I realised it was necessary to dismantle any nostalgic visions related to memory and recollections, so I decided to write a section of my book as a palimpsest of poems and texts written by other writers about a specific site in Rome, trying to exaggerate the effect on the edge between hyper-reality and artifice. The poems and texts I chose were all written in struggle and bloody occurrences by writers such as Pier Paolo Pasolini, Carlo Emilio Gadda, Antonio Gramsci, Herman Melville, in times of personal and political conflict. The effect of hyper-real trick was exaggerated by the fact that I actually never was in that place that I was writing about. Or was I? I think I was, I think somehow I was there because presence is in the words, or at least I think we should challenge the assumption that presence is only made by actuality. What is present, are the borders of the I that make the text, their elastic boundaries expanded and refusing to be one and carved in stone. When they ask me where my authentic I is, I reply it’s in my words, not outside. Ultimately, to the readers, it doesn’t really matter if I was ever there: what matters is the here of their readings. Where does the arbitrariness halt, in such type of operations? It halts once more at the borders of I and its fluctuating archives, on each individual permeable body. As I stitch words together and let the resulting off-centred construction clash with any ideas of permanence, I realise that a distinctive pace holds my words, with recurring rhythms and turns of phrase. Harry Mathews called it the experience of discovery through syntax. Flannery O’ Connor called it the mystery and manners of writing. At first I don’t understand it, yet I am open to the shape my words take on with their own pace. It is the pace of my thinking-breathing, that inhabits me although I cannot tell how it functions; the space where my archive really comes back to life, where I stitch all those fragmented records and traces together, the references that have been layered in my understanding through the years, the singular experience in every edit, absorbed and shadowed by what happens around my words and in spite of them. Then, I am tempted even more to claim for the precariousness of any writing. Because if I believed that words could stand forever on their own, and keep any experiences still, safe and protected within, I would be beaten: they are eroded by what they do not say but prompt to say. In recent months I have become more and more concerned with responding to sounds by working on pacing and form. I’ve been working recently on a series of texts that start with a seemingly rational proposition and then crumble down into interpretive delirium: for me it’s a way to reclaim the enjoyment and complexity and incoherence in listening, and to work with the residual aspects of listening, all those thoughts and detours that are often dismissed as irrelevant and that seldom find a place in texts on sound. I’m interested in trying to state the inability of naming ‘these sounds’ and yet the possibility of writing them nonetheless. In this context I always like to mention a passage from the book Sound and Sentiment by Steven Feld. At one point, he appears riddled while he’s cataloguing and classifying birdsongs, and one of his Kaluli guides tells him, ‘Listen – to you they are birds, to me they are voices in the forest’. I like to think of the references within a text as voices in the forest. They are not markers of something else, they make my words and prompt me to wander and get lost in them, not to classify them. Hopefully they also invite the readers to wander in their own forests too, and the entire process is like a passing on of prompts to pass around and through. My Pasolini and my Melville and many others are the voices in my forest, through which I have learned to understand and be accustomed to or curious toward the world. They don’t denote the stillness of classification but the contingency of my history with them. And when I say that each text has a history, it’s a history not with a capital H but a small h, and maybe we could talk about the aspiration in the h of history echoed in the h in ephemeral: a whispering, a transience. From the double you of where, to the h of history and how. I told you of reference as material, now I’d like to switch from material to medium: a space to connect. My medium is listening onto writing and back, writing onto listening: there I connect. Medium is also illusion, and trick, and risk. Is it listening to, or listening through? Illusion, or understanding? I can never describe a sound, I can write sound: I can build a frail yet precise cobweb of words and cut-off blanks. It almost feels as if I was never quite entirely there. Not if I found the appropriate words, the correct way of speaking, the correct tone of voice. I write and each word is accompanied by another underwhispering, fragments rustling out toward me, kernels of another despatch, receiving and transmitting into this day and into the coming night and at once sending them inward, to the assumed crucial point of each memory. New memories mix with older, more traditional versions of my past and rewrite it, until sometime in the stiff dance of these alphabet letters I drift away absent-minded along broken lines and it’s really no longer I writing, but they. I begin to wonder about this system of tricks and echoes and relays in writing/listening – like Dante in Inferno Canto 13, when he’s lost in yet another forest, and hears disembodied voices as their souls are caught in trees, and there is one verse that goes ‘I believed that he believed that I believed’, I think of echoes and mishearings that write. Discussing The Nature and Aim of Fiction Flannery O’ Connor wrote: ‘People have the habit of saying, “What is the theme of your story?” and they expect you to give them a statement [such as]: “The theme of my story is the economic pressure of the machine on the middle class” – or some such absurdity. And when they’ve got a statement like that, they go off happy and feel it is no longer necessary to read the story. … Some people have the notion that you read the story and then climb out of it into the meaning, but for the writer the whole text is the meaning, because it is an experience, not an abstraction.’ Experience writes. It is generated by the time spent looking, staring, listening, recalling … reading. It will never reveal layers of clarity: it’s about deepening and articulating the sense of mystery and incoherence and complexity in life – what I can witness to, not what I can theorise about or clarify. That’s why I aim for what has not yet been written or understood. Never satisfy, always point away and aside: on those borders between the I and the double you’s, and their doubles. I have been working these months to make my writing fleeting, to make it so that it’s not possible to take notes out of it, to make it unquotable, no resolving sentences or all-encompassing conclusions. I have been drawn more and more to writing texts that have a tendency to disappear, and that will convey in you a feeling of ‘having been there’ although not quite sure where. Welcome to En abime, part 2: Ephemeral. I read some words by James Clifford: ‘A disciplinary habitus has been established around the embodied activity of fieldwork,’ he wrote sixteen years ago in his book Routes. Travel and Translation in the Late Twentieth Century as he questioned ‘the habitus of the neutral eye’ in fieldwork and looked at the margins, at fringe activities such as the journals of travel writers, not constrained by diktats of ethnographical practice and free to explore instead more tormented questions that arise or are silenced when visiting a place. The habitus of the neutral ear often creeps into evaluations of recordings. Where do we stop treating a record as a document and begin considering it as an open field for entangled subjectivities? Art versus Document. The dissident Surrealists were no strangers to the slippery edge between the two, their periodical Documents (1929-30) attested the imaginary and subversive potential in mutual crossing over between what is deemed objective (a ‘document’) and what is not. The unsettling impact of these documents is a function of the editing glance (in our case, ear) that deploys it. The notion that a recording/document is *only* an intact, unchangeable, objective source and ‘not art’, masks some practitioners’ unwillingness to come to grips with aesthetic and conceptual considerations. Documents are not intact, unchangeable; recordings, every time we play them, are escapes out of fixity. Not a still aural presence, but a mutable entity that allows the listeners to slide into the space of their own fictions, hesitations, questions, not the certainty of a pre-set agenda. I’m interested in the shift from real to fiction and the sliding back from fiction to real that occurs every time we are confronted with recorded sounds. They prompt rather than document, they prompt the listener not to classify, but to interpolate. No recording can coincide with the event of each experience of hearing, and a recording is not a time-capsule-on-demand (the madeleine was an accident, not an enforcement of memory deliberately picked from a tidily organised collection of keepsakes). Time cannot be kept, we live and listen with records and documents, not because of them. Now I think of the field of my experience, not recorded, but recalled. Where, and how do I articulate it, when I recall in listening and reading and then I write? Rather than considering memory, I’d like to think of the history of a memory, as it moves from fixed document to yet another reinvention, slightly different every other time, transformative and entangled. I think of sounds for which there cannot be any trace, no record, and what I can make with them. Once more I think of fabulation. Fable in the Renaissance was artificium occultandi, artifice of concealment. Think of all the veils, the tricks and devices that I can deploy. Therefore I cannot believe in the existing rhetoric around heritage and collections as frozen and transparent sites of permanence. I think of my heritage consumed into the spaces of reinvention, yet another artificium occultandi. It is a sense of unknown or ungraspable drift, that recordings can trigger. Not as untouchable documents calling for classifications or taxonomies, but eliciting what is not there: a shift, or, as I read in Landings by Richard Skelton, an attraction toward ‘the inert space that borders’ each sound. To listen away from a place always tips over to listening in another place.